The Monarch butterfly is one of the most familiar of butterflies; it is a widespread, common species. The Monarch is native to North and South America, but spread throughout much of the world in the 1800's. They were first seen in Hawaii in the 1840's, and spread throughout the South Pacific in the 1850's-60's. In the early 1870's, the first monarchs were reported in Australia and New Zealand. Both sexes have quite similar appearance, although the male monarchs have a dark spot on the hind wing (scent scales, associated with pheromone production). The almost equally well known caterpillars are banded with yellow, black, and cream. Long tentacles are present at both ends of the body of the caterpillar. The larva feeds on milkweeds (Asclepias spp.). 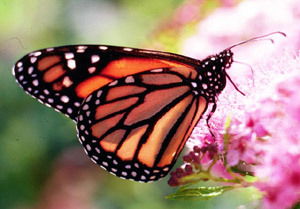 The Monarch is best known as a traveler; it migrates each year from its overwintering sites in Mexico, the coasts of California, and the coasts of the southernmost eastern states to the northern states all the way to southern Canada during the spring months and returns to the overwintering habitats during the fall. The adult butterflies that emerged in the north return to the same overwintering sites where their great-grand parents started their migration the previous spring. There are two distinct Monarch populations in North America. The eastern population breeds east of the Rockies and overwinters in Mexico and at a few locations in the southernmost states. Meanwhile, the western population breeds west of the Rockies and overwinters along the California coast. Although the Monarch is not an endangered species the annual migration is considered a threatened phenomenon by IUCN. Since there are very few overwintering sites where the adults aggregate their populations become vulnerable. These sites are threatened by human activities (what else…) in Mexico and California. Logging, development, and agriculture are the most serious threats. In order to save these sites the Monarch Project was created in 1984. Working with government officials, land trusts, parks, public agencies, scientists, developers, and conservationists, the project achieved significant progress but the high property values in California continue to threaten overwintering sites. In Mexico, the locals desperately depend on income sources from logging and agriculture. The Mexican conservation organization, Monarca, works closely with governmental agencies and local people to establish land protection and enhance alternative economic development in the region. Although the breeding grounds of the Monarch in the northern regions are not seriously threatened, development, pollution, and the use of pesticides might have a significant negative effect on them in the long run. Recently, attention turned to the toxic effects of the pollen of genetically modified corn: the data collected so far suggests that the larvae can be killed or retarded in growth if fed on milkweed leaves dusted with Bt corn pollen. The Monarch butterfly is an important species in insect conservation because it is a “charismatic” species; public awareness about habitat destruction, pollution, or other environmental issues can be easily increased if the Monarch is threatened.